Dapper Danny Ocean (GEORGE CLOONEY) is a man of action. Less than 24 hours into his parole from a New Jersey penitentiary, the wry, charismatic thief is already rolling out his next plan. Following three rules - don't hurt anybody, don't steal from anyone who doesn't deserve it, and play the game like you've got nothing to lose - Danny orchestrates the most sophisticated, elaborate casino heist in history. In one night, Danny's handpicked 11-man crew of specialists - including an ace card sharp (BRAD PITT), a master pickpocket (MATT DAMON) and a demolition genius (DON CHEADLE) - will attempt to steal over $150 million from three Las Vegas casinos owned by Terry Benedict (ANDY GARCIA), the elegant, ruthless entrepreneur who just happens to be dating Danny's ex-wife Tess (JULIA ROBERTS). Coincidence or motive? Only Danny knows for sure. To score the cash, he'll have to risk his life and his chance of reconciling with Tess. But if it all goes according to Danny's intricate, nearly impossible plan, he won't have to choose between his stake in the heist and his high-stakes reunion with Tess... or will he? In Ocean's Eleven, wry, charismatic con man Danny Ocean (GEORGE CLOONEY) is paroled from prison and immediately begins orchestrating his latest plan - to pull off the most daring heist in the history of Las Vegas. The target? Three of the most popular casinos on the Vegas Strip: The Bellagio, the Mirage and the MGM Grand. Secured beneath 200 feet of solid earth below the Strip is a vault that safeguards every dime that comes through these three casinos, which happen to be owned by Terry Benedict (ANDY GARCIA), an elegant, ruthless entrepreneur. As smart as he is ruthless, Benedict doesn't hesitate to do whatever he thinks is necessary to get what he wants - be it hotel or girl. In this case, it happens to be Reuben Tishkoff's (ELLIOT GOULD) beloved hotel and Danny Ocean's ex-wife Tess (JULIA ROBERTS), who has moved to Las Vegas to begin a new life as curator of the Bellagio's Art Gallery. 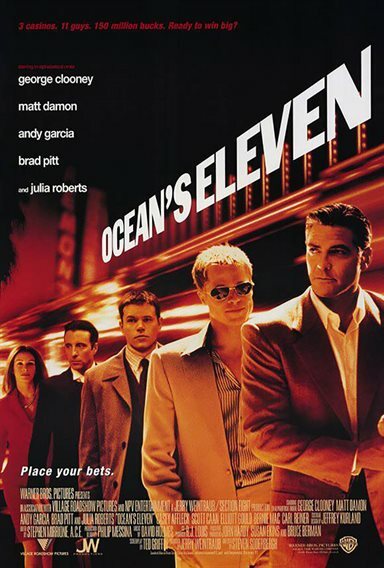 Download Ocean's Eleven in Digital HD from the iTunes store. Ocean's Eleven images are © Warner Bros.. All Rights Reserved.